This is my first year teaching English, so back in August, I was looking for all the help I could get. Structuring my curriculum for the year was a challenge compared to my History classes (which pretty much just progress chronologically). Even though I had a district pacing guide for my English classes, I was a little overwhelmed with the task of trying to fit all of the content into one year in an organized and logical fashion. I’m actually still trying to nail this down, but one structural decision has really helped me this year. On Wednesdays we get out of school about an hour earlier than usual, so each class period is a little shorter. (Well, the students get out early. The teachers have to stay for professional development). I decided to make those days Grammar Wednesdays. I had a feeling I might get swept up in all the stories and worksheets and essays, and forget to cover the basics. Many of my students speak another language (which they usually cannot write), and they’re only, you know, like eleven, so grammar lessons are very important for them. Most people probably hated grammar lessons as a kid, but let me tell you, my students LOVE Grammar Wednesdays. 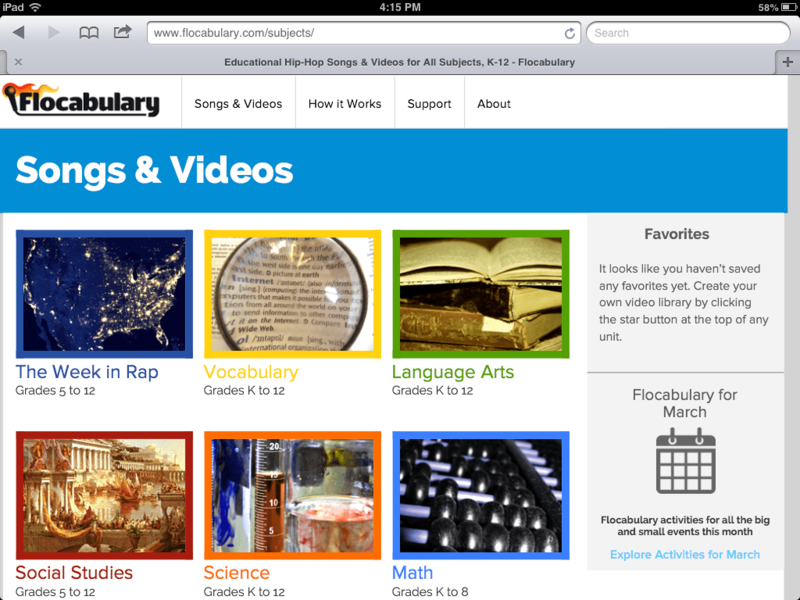 I wish I could take credit for that, but it’s really because they love the videos on Flocabulary.com. The videos also come with tests in pdf format, so you can quiz your students to assess what they learned. Usually, I will let my students watch the video once through, without any worksheet or anything to distract them from the song. The songs are really catchy, so usually after that first run-through they can sing most of the chorus already. Then I hand out the test and just let them work on it while I play the video a few more times. Some students fill it in right away and then just dance in their seat to the video, and others have to really pay attention to the video until the answer they are looking for comes up. We go over the answers together after that, to make sure that each student has all the correct answers. Since I make sure that everyone has 100% of the correct answers, I don’t really grade this assignment. I just 3-hole punch their worksheets, and they have to keep all their grammar worksheets in their binder. 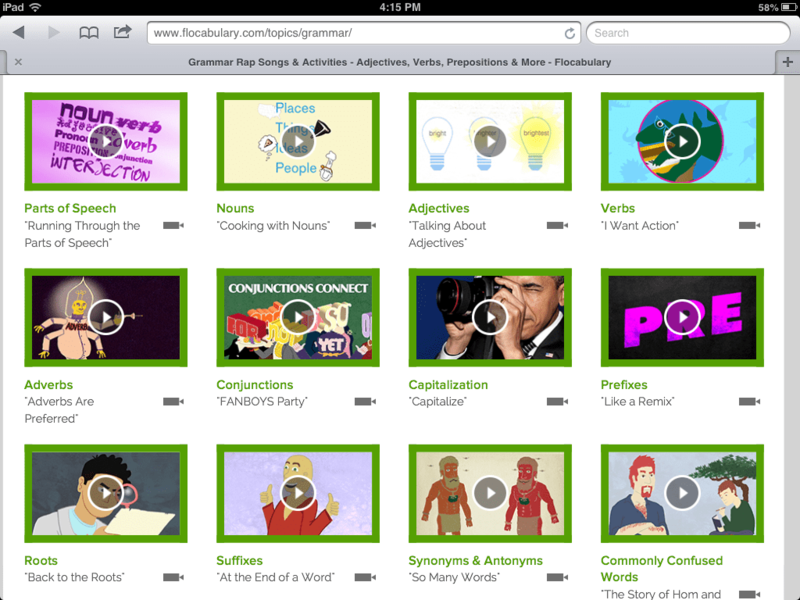 At the end of each quarter, I give a grammar “final,” using questions from Flocabulary. We take a day or two at the end of the quarter to go over and study all of the grammar worksheets to prepare for the final. Here’s the kicker: you do have to pay for the service. I pay $7 a month for my personal account, but if your school or district signs up, the prices are a little different. $7 seems like kind of a lot when you multiply that every month, but for me, it’s worth the time that I save planning grammar lessons and making grammar worksheets every week. Plus, nothing that I could come up with would be nearly as entertaining as the hip hop videos. If my students are good during the lesson (which the always are), then I turn it up and play it one more time at the very end of class and let them dance around and sing to it. They’ve had full-on dance battles while simultaneously singing about grammar. To me, that’s $7 well spent.